Being a food blogger is the best job. Our family could go years and never eat the same thing twice. But if we are not careful, we can also eat weird things at weird times, eat too much of one thing (usually trying to get a recipe right) and not enough of another. When I realize that our diet is off center, the first thing I do is start making more vegetables, especially leafy green things. I am not sure about your house but it is not easy to get leafy green things in my little kids on a good day for dinner, much less for breakfast. Who am I kidding, I have a hard time consistently working them into my breakfast too. I don’t want salad for breakfast. I wish I was one of those people who woke up craving lettuce. But I am not. I am one of those people who wakes up craving coffee. I prefer it hot but with three kids, even lukewarm will do. But I LOVE smoothies. They are easy and delicious. This particular smoothie is a favorite of ours. I usually use baby spinach because the taste is so mild. But most greens will work just fine – chard, kale or spinach. Also this is less a recipe than it is a guide. I switch it up based on what I have in the freezer. I do occasionally buy frozen fruit for smoothies if I don’t have other options. But I keep an eye out for ripe fruits that have been marked down. It doesn’t really matter if they are pretty since I am going to freeze it and blend it up anyway. But I save the most money by buying in bulk from the farmers market when fruits are in season. You can often get a good price on farmer’s seconds – especially if you are buying in bulk. 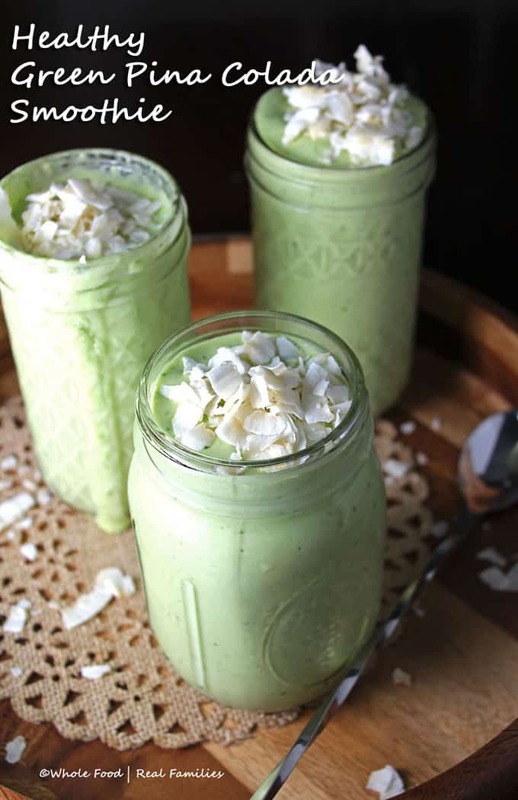 Looking to squeeze in some greens in other healthy smoothies? 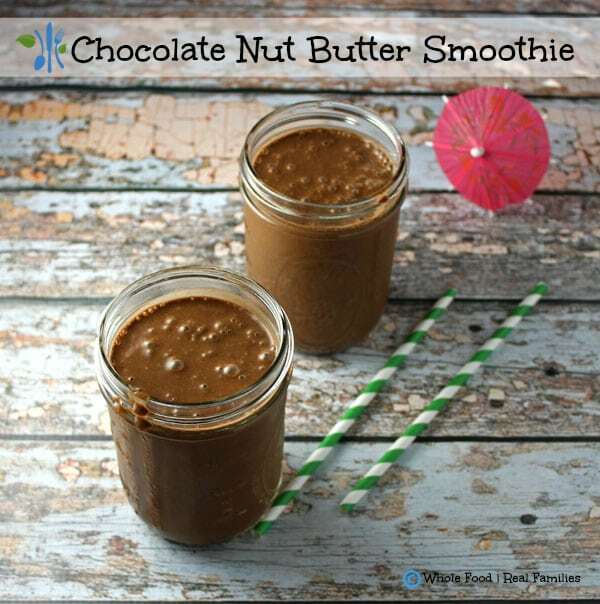 This Chocolate Nut Butter Spinach Smoothie is one of the most popular on this website. And this Immune Boosting Smoothie is one of the most popular in my kitchen! Use this recipe as a guide! Change the quantities and ingredients to fit your taste. 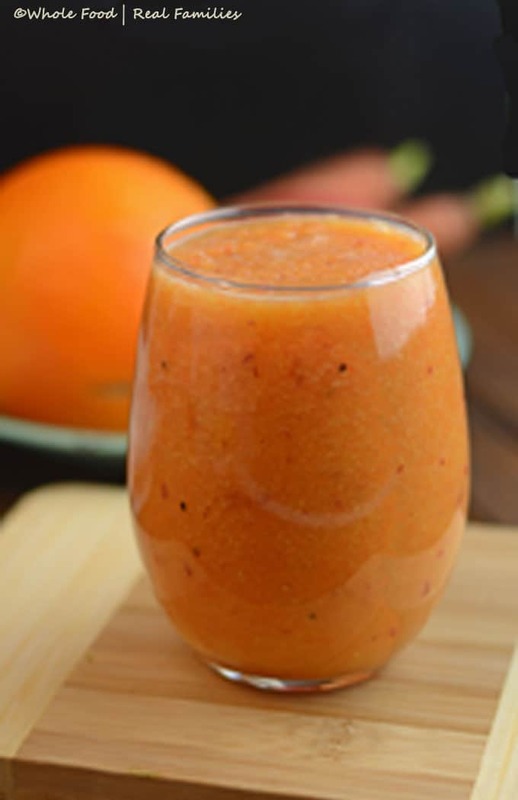 Combine all ingredients in the blender and blend until completely smooth. 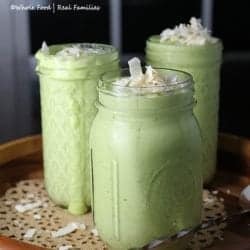 Top with toasted coconut if desired! Made this today & it was really good! Thanks for the recipe. Mmmm! I LOVE this recipe 🙂 7 whole food ingredients mixed into a delicious smoothie?! Yes, please! So excited to have found your blog. Whole foods are the building blocks of healthy family meals. Keep it up! This sounds amazingly delish! I will be trying this soon! I found you on Whimsy Wednesday. This sounds delicious. Just pinned and hope to try tomorrow. Thanks for sharing.